This installation consists of 15 identical geometric steel forms, each three feet tall, arranged in 15 unique positions. 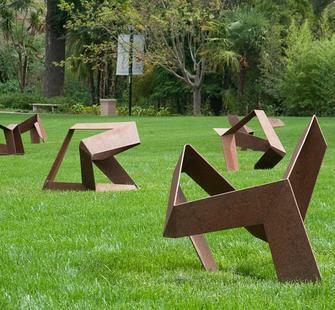 They are installed on the lawn in an organically-shaped grouping, so that as you move between them, shifting vantage points cause your understanding of the forms themselves to change. Visitors are encouraged to consider how different each form looks, despite the knowledge that they are identical. The title Roshamon is borrowed from Akira Kurosawa’s 1950 film of the same name, in which four eyewitnesses to a crime deliver vastly different testimonies about their perception of the events. Rashomon is available for purchase. Please contact Kelly Sicat at ksicat@montalvoarts.org for more information. Rashomon is organized by the San Jose Institute of Contemporary Art, San Jose, CA.